A hopeful story: You Are Never Alone – Joyce's mystery and fiction book reviews with some non-fiction too! 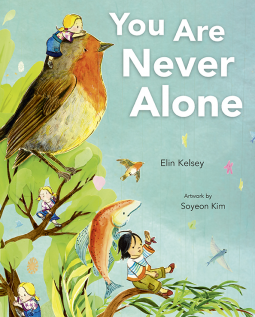 ” I want to look every kid in the eye and say, ‘No matter what is happening in your life, you are never alone.” This author would like for children to have some sense of hopefulness about their daily world and the planet that we all share. She expresses optimism about the ways in which nature replenishes the environment. This book has truly lovely illustrations. They are charming and imaginative and suit the text perfectly. This book will be a welcome addition to young nature lovers bookshelves. Please note: Some of the facts presented may be slightly off putting to children, as for example, noting the micro-organisms on our skin. Thanks to the publisher and NetGalley for this advance read in exchange for my honest opinion. *** (three stars) I am going to start including the star ratings on the books that I review for NetGalley. I hope that this will be helpful.